Bangalore, Montreal, London, Nairobi are some of the places where I can access a kitchen to try out ingredients that I don’t readily get in Mombasa. Portobello mushroom is one of them. The first time I ever had a portobello mushroom was some years back when I went to Nando’s in Leicester with my sister and her family. Knowing my love for mushrooms she suggested that I should try the portobello mushroom and halloumi burger. I loved the burger and taste of the portobello mushroom. After that I’ve had portobello mushrooms either grilled or as a filling for burgers. However, I’d not made anything with the mushrooms at home. So during the recent trip to Montreal, cooking with portobello mushrooms was ticked off my list. Belonging to the crimini family of mushrooms, portobello mushrooms are low in calories, rich in both protein and carbohydrates. Its a good source of fiber, copper and selenium. Portobello or portabella mushrooms have a texture quite different from the button mushrooms and also taste different. I decided to grill them with tomatoes and cheese as I love caprese salad. You can always use other ingredients as stuffing to make it into a healthy low calorie meal. Grate or tear into small pieces the mozzarella cheese. Wipe the mushrooms with a damp kitchen towel. Heat butter in a small pan. Switch on the broiler/grill on high. Brush the bottom of the mushrooms with garlic butter. Place the mushrooms in the tray with the caps up. Brush the caps with the remaining garlic butter. Fill the cap with tomatoes. Grill the mushrooms for 8-10 minutes or till the cheese melts and the mushrooms are golden brown in colour. Sprinkle pepper and salt over it and serve. Usually caprese means that its served with balsamic vinegar or syrup. Since that would have tasted sweet my family didn’t want it on the mushrooms. But you can make or use ready made balsamic syrup or glaze. Mix ¼ cup balsamic vinegar and add 2-3 tbsp of brown sugar. Bring it to a boil. Reduce the heat and let it simmer for 5-8 minutes till it becomes thick. If you don’t get baby tomatoes, dice normal tomatoes. Serve this dish along with some soup or a salad. 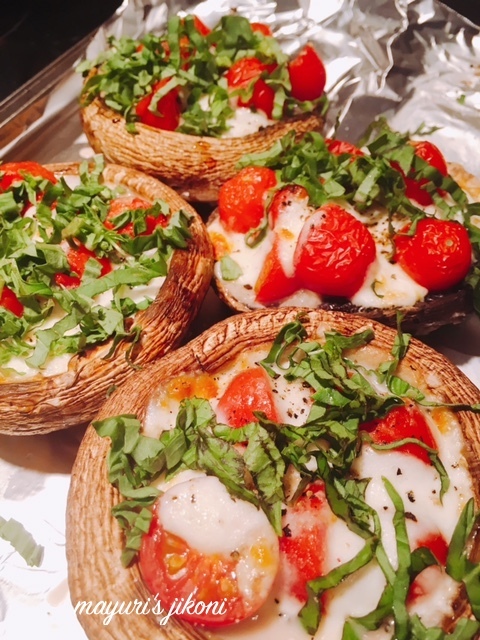 Omg, those caprese stuffed portobello are seriously alluring. My mouth is just watering here. Very tempting to the core. Wow that dish looks fantastic!..I have been wanting to make caprese based dishes, this one looks so nicely done..
Bookmarking the recipe Mayuri. Mushroom is everyone's favorite at home. Stuffed mushrooms are a treat by themselves and yours look absolutely fabulous, very colorful. This is simply yummy.. I never got to taste portobello so far.. Must be really delicious.. I have seen this mushroom in masterchef series but never got a chance to cook with this as we don't get it here. Looking at your stuffed mushrooms I am so tempted to try. I can get everything but the Portobello mushrooms. What a pity this is something that my family will enjoy. Beautifully done Mayuri. Those stuffed portobello looks amazing. I love the idea of stuffing them with tomatoes and cheese. Portbello mushrooms are my favorite and this caprese stuff one, omg. I am sure I can't get enough of these. Great pick. Very new and interesting recipe specially love the style of serving.. mushroom with caprese salad. oh wow 🙂 this is a Masterchef kind of dish – the husband who loves mushrooms wd love this ! Caprese with mushroom sounds so innovative and interesting.Looks healthy and colorful. very new recipe. mushroom with caprese salad.